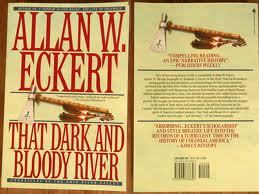 That Dark and Bloody River Research Papers explore a book by Allan W. Eckert about the bloody battles between the white settlers and the Indians over land. That Dark and Bloody River, by Allan W. Eckert, tells the tale of the settling of the Ohio River Valley and why the river came to be known as the book’s ominous title. Eckert provides a disjointed chronological story line in the form of documentary fiction of the battle for the territory of the Ohio River. Excerpts from mainly military sources tell the tale of a bloody battles and brutality on both sides of the conflict. Noticeably absent from the narrative are stories from the Indian perspective, however Eckert is very fair in his portrayal of events. While he seldom assumes to put words in the mouth of the Indians, although he takes considerable liberty in narrating the story lines of many of the battles fought on the Ohio. The book begins with introducing the beginnings of trouble along the Ohio River – white settlers. The land began to be claimed by settlers from the east in a primitive method of land claiming called tomahawk improvements. Settlers would claim their land with their initials chopped in the trees on the boarders of their land and claim their right to the territory. However, time after time, the families would disappear and the only their name in the trees would remain. Indian massacres were the price that one would pay for the risk of claiming land along the Ohio River. The Indians along the Ohio were fighting to keep their land the settlers were struggling to overtake the rich territory along the Ohio. The 981 miles from Pennsylvania to Illinois was the main route for the pioneers from the East. However, standing in their way were the Shawnee, Miami, Cherokee, Iroquois, and various other tribes. The land at stake was valuable and Eckert illustrates aptly that both sides had much to loose and much to gain by keeping it. The struggle for settlement had tainted both settlers and Indians, causing horrific encounters of brutal warfare. The white settlers learned to shoot first and then ask questions, as in the case of “crusty old Sam Meason” who shot a young Indian messenger of peace before knowing he was bringing a message of conciliation. They also learned to scalp Indians, just as the Indians had scalped the white settlers in a brutal warning to all who witnessed the aftermath of an attack. An air of mutual mistrust continually pervaded over white men and Indians alike, neither side guiltless of atrocity. Paper Masters writes custom research papers on That Dark and Bloody River and explore a book by Allan W. Eckert about the bloody battles between the white settlers and the Indians over land.